There are a few things that if you go to Florence and do not do, you must lie to me and tell me you did do them. I’m not an expert on the city, I’m just an aficionado, and that can be almost as good. So if you want a few insider ideas from a gal who loves the city, I’m your girl, and read on. Even if you’re not planning a trip, virtual travel can be rewarding, so I say, still read on! My recent trip to Florence was my fourth visit to the magical Renaissance city, and I’ve come to appreciate its second and third layers beyond the Duomo (and yet, the Duomo is not to be missed). But I want you to think of the city as a multi-layered art-, food- and wine-lover’s paradise, and you do need to peel back the layers. Italy simply put cannot be lumped together as one. Yes, it’s a single country, and good food, wine and an appreciation of art and beauty can be expected anywhere; however, the country was not united until 1871. Each area has its distinct characteristics and time in history. Florence’s heyday was the Renaissance. While its rise to power started long before, in the Middle Ages, with Gothic art and Dante’s Divine Comedy, it was the Renaissance when everything came together and Florence became a force in and of itself. So now that you have a reasonable understanding of the Renaissance and you know the difference between Gothic-pointed arches and spires as compared to Renaissance-rounded arches and domes, clean, simple lines and Humanism, you’re ready to visit Florence. There were no sites I went to that I considered a bore or that could be easily overlooked; they are all fantastic. If your guidebook recommends it, it will be worth your while. But I highly, highly, recommend a guide. Rick Steves lists several in his guidebooks, and TripAdvisor has referrals. There is so much information packed into each site they can almost come alive for you if you have the “key.” A good guide is that key — unlock it! It’s money you will never regret spending. I also strongly recommend going off-season and for several days. Anything shorter than four nights, leaving three full days, is cheating yourself. So now for my absolutely favorite Florentine experiences. 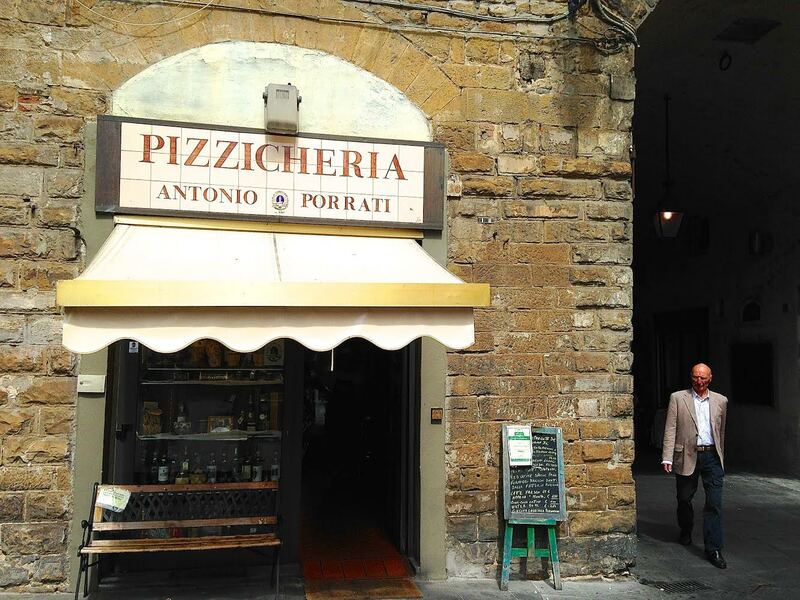 Please, please, please make the effort to find Pizzicheria Antonio Porrati restaurant on the Piazza di S.Pier Maggiore. You can find it on Trip Advisor and the address is 30/R., Bergo Degli Albizi. This is a lunch or late-day snack spot. Check online for hours and grab a table outside and let the folks behind the counter feed you. Pizzicheri is quite the experience, with the most smiling jolly owner you could ever want to meet. Don’t forget to ask for the house wine; it’s good — and a dollar a glass. Buon Appetito and Salute! 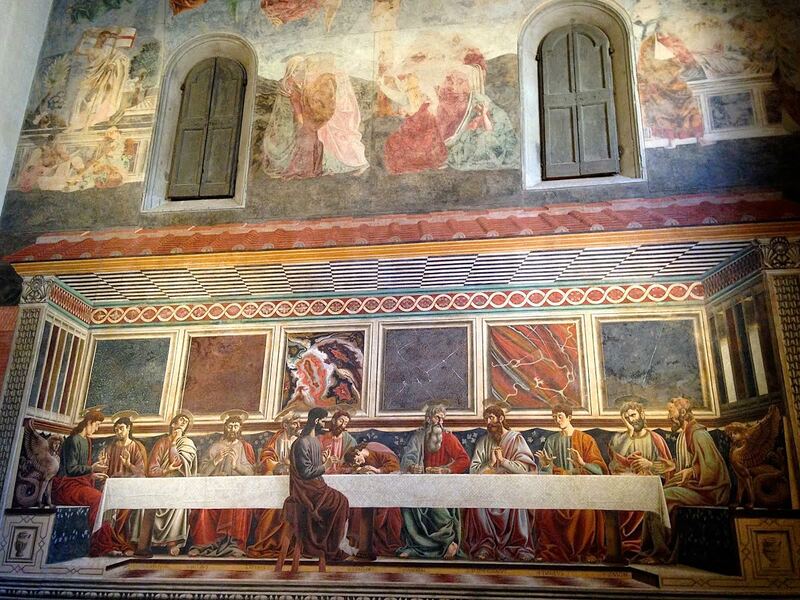 In art, you have to tell me you went to see The Cenacolo of Sant Apollonia and The Last Supper fresco by Andrea del Castagno. It’s a minor sight — it most likely is not in your guide book — but it’s so worth it. You will find it on Trip Advisor #52 of 224 sights. So why am I sending you here? It’s a quiet convent in Florence where you can walk right in and be almost alone with a uniquely Florentine Renaissance masterpiece. The fresco is in nearly perfect condition and is the reason you’re here. It’s peaceful, there are no crowds and you can grab a seat and let this work of art fill you. Castagno is a early author of the Renaissance, and his work can only be found in Florence, due to his death at the young age of 26. I could cite for you many reasons this work is important, from its Florentine Renaissance characteristics, like strong use of drawing and each disciple depicting a different emotion (hello, humanism), to the marble backdrop with its nod to Ancient Rome. But this is not why I send you here, I send you here to let the preciousness and beauty wash over you. Behold the Renaissance. Screwpads: a majority of sailboat owners like the adjustable that screwpads have to offer.